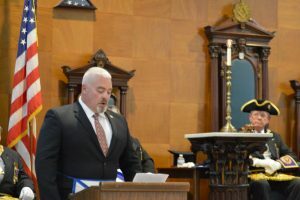 On April 22nd, the Melrose Masonic Building was rededicated as a commemoration of its 150th year of existences. In attendance, was a contingent of Grand Lodge officers led by the Grand Master of Massachusetts, Most Worshipful Paul F. Gleason. The following is the first speech given on that occasion by Bro. Ward Hamilton. Good afternoon. My name is Ward Hamilton and I am a member of the Melrose Historical Commission. I am also a third generation member of Wyoming Lodge, born and raised in this City like my father and his father before him. When my son joined Wyoming Lodge last June he became a fifth generation freemason and fourth generation member of the lodge and, the same month, a fourth generation graduate of Melrose High School. Our family is proud to call Melrose our home. In the middle of the seventeenth century, a section of Charlestown known as Malden was incorporated as a separate town by the same name. Over the next two hundred years the northern portion, which included most of Melrose, came to be called North Malden and remained a sparsely populated farming community. In July of 1845, the Boston and Maine Railroad began service through the area and the added passenger stops brought many new residents as the era of the commuter rail was born. As the village of North Malden grew, life there was distinct from that of Malden Center. A petition was filed and the Town of Melrose was incorporated in 1850. Three years later the Melrose Highlands was annexed from the Town of Stoneham and the city’s current borders were created. As the farms and fields were divided and sold for building plots a portion of the Upham and Lynde farms was reserved for a public park and named Melrose Common in 1856. Growth was exponential and by 1860, in just a decade, the population had doubled. And then the war came. When the Civil War erupted in 1861 the town numbered some 2500 men, women and children. Over the next four years 375 men and boys from Melrose—nearly a third of the whole male population—served the Union. Eight would be killed in action and thirty-nine wounded. Another sixteen would succumb to wounds or disease; others from starvation, prisoners of war in infamous rebel prisons like Andersonville and Belle Isle. By far the heaviest loss of Melrose soldiers occurred on a single day—September 17, 1862—at the Battle of Antietam. Over 23,000 men fell casualty in the battle making it the bloodiest day in American history. As a result of the Union victory at Antietam, President Lincoln issued his Preliminary Emancipation Proclamation just five days later. In the era that followed the war, Melrose would change in many ways and experience a period of previously unsurpassed growth. The last saloon, opposite City Hall, was closed in 1865 and over 150 years later Melrose was the only dry city in the Commonwealth. Indeed, a great many of the community’s social and fraternal organizations focused on the temperance movement. The cornerstone of the present Masonic Temple was laid in 1866 and the building dedicated on April 24, 1867. In 1869 a high school was built in the present location of the library on West Emerson Street. That same year, great works were underway to improve sewer drainage infrastructure and to draw fresh water from Spot Pond and deliver it to homes in Melrose and neighboring communities. Long time institutions like Deering Lumber and the Melrose Savings Bank were founded in 1872 and provided the resources needed by the community to sustain continuous growth through the coming decades. The fire department and the school district were expanded greatly in the 1870s and the town hall was built in 1873. Many grand churches and homes were erected throughout Melrose which, to this day, fill the City with a treasure trove of great buildings built in the Second Empire, Queen Anne, and other traditional architectural styles. As the end of the nineteenth century approached, other well-known buildings were planned and later built: the current Carnegie library, the central fire station, the YMCA, a new high school (later named the Coolidge School), many of the churches seen in the City today and memorial hall. By Act of March 18th,1899, Melrose became the thirty-third incorporated city in the Commonwealth of Massachusetts. The population had grown to nearly 13,000, more than ten times the number of inhabitants just fifty years earlier. 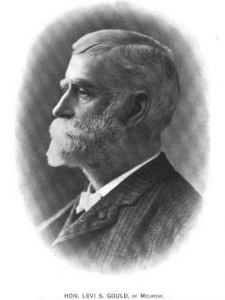 On January 1st, 1900, Levi Gould (above) assumed office as the first Mayor of the City of Melrose. A past master of Wyoming Lodge and active in other Masonic orders, public service and civic organizations, Mayor Gould was a direct descendant of the first settlers in the area. At least nine of the first twenty-one men elected to the Board of Aldermen were members of Wyoming Lodge and active in the business, civic and religious life of the City. The history of Melrose in the second half of the nineteenth century and its evolution from a farming community to a town and—later—a city of great prosperity is intertwined with Freemasonry and the members of Wyoming Lodge. Today we rededicate the building where these men gathered, honor their memory and recognize their contributions to the development of the City of Melrose.